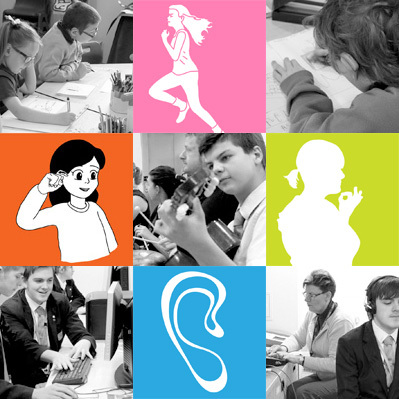 Schools will receive advice, support and training from Teachers of the Deaf, to help them understand the nature of hearing impairment and its management, to meet the needs of the pupil. The class teacher will monitor pupils' progress and seek advice if required. Pupils with hearing impairment will be included in all class activities. The teacher will ensure that the pupil with hearing impairment sits in a position in the class where the pupil can see whoever is speaking; the teacher and other pupils. Classrooms should be as free from background noise as is possible, with doors kept closed to create quiet areas. The teacher will need to repeat what other children are saying to ensure that the pupil with hearing impairment has access to all communication exchanges. The pupil will be given time to answer questions and be given extra time to complete work. Visual cues in the form of written text or illustrations/pictures should be available for the pupil to understand new ideas or concepts. Staff knowledge and understanding is a key factor to Quality First Teaching. Families will be involved at every stage. The Teacher of the Deaf will visit the pupil in school. The Teacher of the Deaf will verify the functioning of the pupil's own personal hearing aids by subjective and objective testing If the pupil is using a radio aid, the Teacher of the Deaf will make sure the teachers receive training on how and when to use it. The Teacher of the Deaf will spend time with the class teacher to make sure the pupil is fully included in the class. The Teacher of the Deaf will plan with the class teacher to make sure the pupil understands the work. to develop listening, language, speech and communication. to help develop the pupil's self esteem and confidence. to help the pupil manage their own hearing aids. to differentiate language content, to make the lessons easier to understand and to enable access to the curriculum. 'Additional Support' relies upon staff knowledge and understanding around the pupil's strengths and needs. Staff need the skills to develop, apply and evaluate individualised plans and strategies.